Design39Campus, part of the Poway Unified School District in California, hosts a space for individual, small, and large group work. One of the main drawbacks to a passive learning environment is that it provides few opportunities for students to develop the skills that are so important in the digital-age workplace. When teachers control the topics and pace of learning, the ways students access knowledge, and the ways they demonstrate what they’ve learned, students can’t develop their creativity, collaboration, and problem-solving skills. And when the only audience for student work is the teacher, students can’t develop the flexible, effective communication skills they need in a digital age. All digital-age skills are, of course, important. But it is collaboration that is often identified as among the most critical skills for the future workplace. It is also fundamental to active learning. Collaboration in the classroom can meet two important instructional goals. First, the development of collaboration skills is itself an important learning objective. And second, research conclusively shows that well-designed collaborative activities contribute to improved learning. Incorporating collaboration into a traditional classroom environment poses many challenges. Students need spaces where they can meet with each other. They need access to the tools that support the kinds of thinking that helps them learn, often at the same time that other students are working alone or with the teacher. Digital-age learning environments also need to support collaboration among adults, mentors, and peers outside of the classroom, which are often facilitated by technology. Thinking carefully about how a learning space can support the kind of collaboration that builds confident learners is an important step in designing effective learning environments. 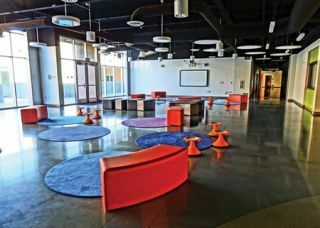 A space for tinkering at Design39Campus in Poway, CA In the industrial learning environment of the 20th century, communication skills such as writing and speaking were relegated to the language arts class; but in digital-age learning environments, communication is a critical component of every subject area. Communication in digital-age learning environments takes on far more forms than it does in traditional classrooms. Gone are the days when an occasional essay or speech in an English class meets learning objectives. Today, throughout the curriculum, students are expected to explain their thinking, persuade others of their opinions, and engage readers and listeners. And students must do so not only with words but also with graphic and multimedia elements. Creativity is another critical skill in the digital age. We all recognize creativity when we see it—in the gadgets we use every day, in the art that makes us appreciate and think about the world around us, and in the ideas that challenge us and help us grow. P21 identifies creativity as one of the most prized skills for the future, and yet the traditional classroom environment often presents more of a challenge than a support for creative thinking. Creativity flourishes in an environment where students can take risks and fail, where they have options about what they learn, how they learn, and how to demonstrate what they have learned. Although you can certainly find examples of student creativity in the most traditional classrooms, flexible learning spaces supported by effective instruction can bring out creativity in all students. Creative thinking is both collaborative and solitary. Students can be inspired to create surprising and useful projects by interacting with peers and mentors. They can get feedback from others and use examples of admired work as models for their own creations. The creative process, however, also requires that individuals find time and space for reflection and self-assessment, thinking through ideas, and imagining how an idea might be brought to fruition. Creativity is both chaotic and orderly. At the “anything goes” stage, the free flow of ideas is crucial. Students need spaces that support interaction and allow them to keep a record of their thoughts, whether it is digitally, on whiteboards, or chart paper. At some point, however, the ideas must be made real, and a clear process must be followed to transform an idea into a reality. Spaces for the development of a creative idea might include tools and resources such as powerful computers with specialized software, 3D printers, art supplies, or building materials. Excerpted from the newly-released book, Get Active, Reimagining Learning Spaces for Student Success, published by ISTE (www.iste.org) and underwritten with support from Intel Education and Steelcase Education. Consider how the following project in a high school language arts class addresses the digital-age skills of collaboration, communication, and creativity; and how the design of the learning space supports learning. Small groups of students choose an allegorical novel to read together from a list provided by their teacher. After they have finished reading their books, each group is asked to create a 3D object that illustrates their interpretation of the allegory presented in the book, including a quote from the book for each component of their object. Each group, supplied with chart paper, meets in a small-group space to brainstorm ideas for their project. One group decides to make a mobile illustrating their interpretation of Lord of the Flies. With a general idea of what they want to create, the group works at a large-screen computer to design and create their mobile. Two students, both are taking a STEAM course, volunteer to use a 3D printer to create some pieces for their mobile. Other group members get art materials, including glue and paint, from a convenient storage location. They put all the pieces of their project together in a production space that features large tables. The activity concludes with an oral presentation of their mobile to other small groups in a small presentation space. The different groups take turns describing their projects and analyses of their chosen novels.